My apologies for the rambling post and glut of photos, but I have tears streaming down my face as I write this. It was October 2001. Mark and had just celebrated our 1st anniversary that summer and we had been in our new house nearly a month and had discussed getting a dog. Mark and I wanted the same thing – a large dog, a rescue, not a puppy. But after al lot of talk we had come to the conclusion that we should wait about a year before adopting a dog. Then one night we watched the movie “Return to Me” and while David Duchovny and Minnie Driver gave decent performances it was the dog, Mel, that won us over. At the end of the movie I turned to Mark and said, “We need a dog just like that. Let’s do it now” and he agreed. We were on Petfinder.com that night. I came across the listing for “Slick” at the Toledo Humane Society. He was 2 years old, a lab-shepherd mix (they thought) and he had big, dark puppy eyes. We went to meet him and he was the mellowest dog we’d ever met. They warned us that he was prone to ear infections and was sensitive around his ears so we were gentle and gave him his space. We could see his personality right away and knew he was our dog. Paperwork was filled out and we scheduled a time to come back to get him. There was no need to worry as that was the one and only time he ever did that. He didn’t answer to Slick (there was some confusion as his name on some papers was Slick, on others it was Flick) so we changed his name to Mac (yes, after Apple computers), which he took to right away. 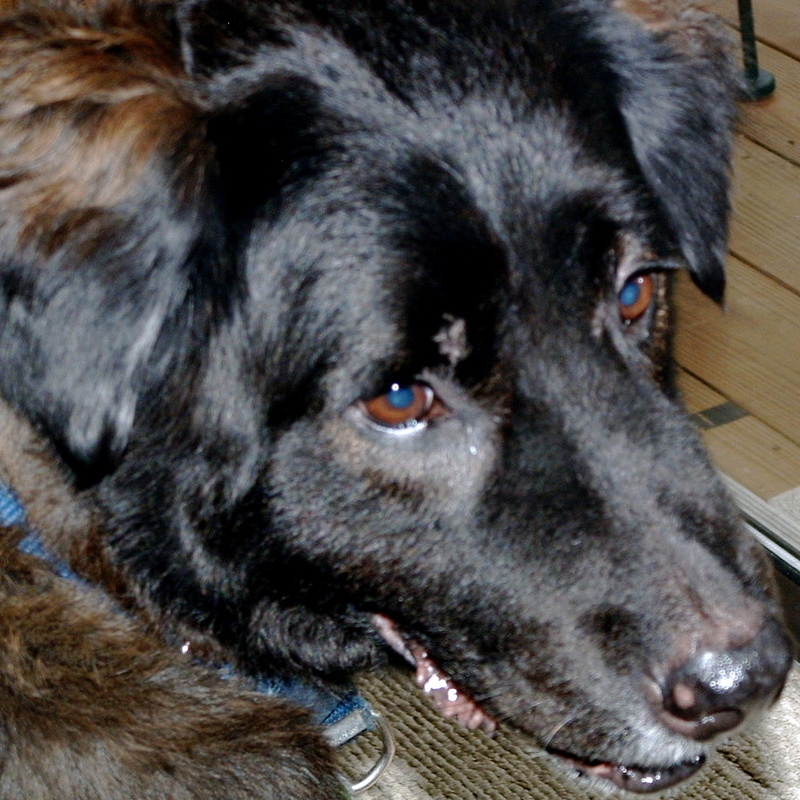 He really was the best dog – housebroken and trained. He never strayed from our yard, even when off-leash, he didn’t bark unless there was a reason to, but if there was reason his bark told you to back off! He never chewed anything that wasn’t given to him or got onto furniture without permission. Yes, he did get nasty ear infections but we learned to deal with them. When we started taking him to our own vet we learned that he was closer to 4 years old which explained his mellow nature. We also came to learn (over time) that he was allergic to wheat and corn, which is what caused the ear infections. I remember a short time where we fed him a raw diet of …I don’t remember exactly but it involved chicken and carrots and maple syrup and we were spending more on his food then on our own! Mac quickly became part of our extended family. Despite his size and his deep, rumbling bark he was gentle as can be around nieces, nephews and the children of friends. At home he sometimes pretended he was a lap dog and crawled onto the couch for a belly rub. He was so chill that we used to joke that when we left for work during the day, Mac put on his smoking jacket and read Proust until we returned. He seemed too dignified for tricks, almost sighing at you when you asked him to “shake”, but he would do it to please you. He did have a few quirks – one was that he hated cages/kennels so boarding him was never an option. Luckily we have good friends who had a golden retriever around the same age and we became each other’s dogsitters. Mac and Kilmer would put on a royal joust each evening they were together, both vying for Mark’s affections. Mac was Mark’s shadow; they had a bond like no other. Mac was Mark’s dog first and foremost. Another of his quirks was his internal clock. No matter where we were or what we were doing at 10 PM on the dot he’d find you to let him out. And if you were late he’d start pacing from you to the back door until you got the hint. Mac was so mellow from the start that it was always fun to see his playful side come out. He loved the snow, and even in his old age would romp around like a puppy after the first snowfall. He’s been a fixture in our house, at family events and in our lives. A constant reminder that all you really need to be happy in life is a nap, a hot dog and a belly rub. About 18 months ago Mac had a seizure. It was awful to witness and so hard to deal with. Our vet, who loves Mac as much as we do, told us to start preparing for the end. Of course Mac was fine for months after that. About 6 months ago he had another. And another. He was often unable to get up from a laying position without help supporting his hind legs. His appetite came and went and he got thin. 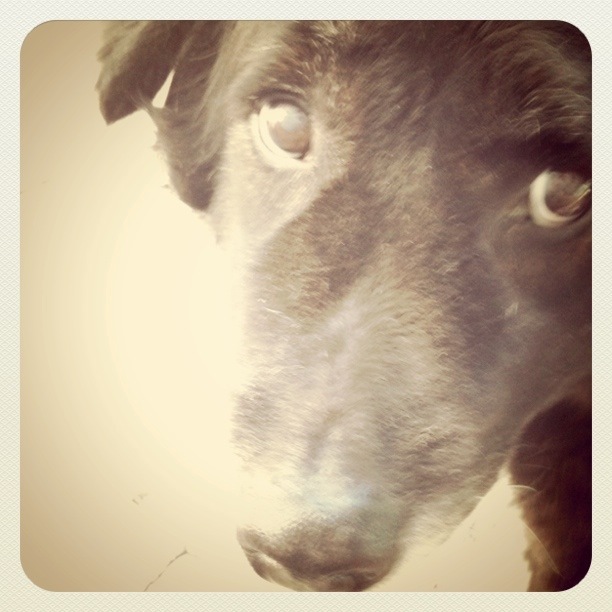 Discussion with our vet found nothing unexpected…he’s an old dog nearing the end of his life. He had a large growth (lump) on his neck and one near his liver. We decided to just let make him as comfortable as possible in his old age and not intervene. Last week he had another seizure and instead of walking around after and “shaking it off” he just lay on the ground, with no energy left in him to gain his bearings. Anther discussion with the vet and we decided it was time to let him go. Today is that day and Mark and I are barley holding it together. As much as we know this is absolutely the right thing for Mac it doesn’t make it any easier. Goodbye, buddy. Thank you for all the joy, smiles and cuddles you brought to our lives for the last 12 years. Thank you for being the best dog anyone could ever hope to have.